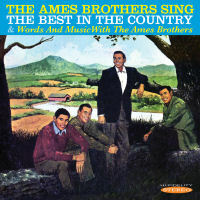 The Ames Brothers were four brothers from Massachusetts who formed a vocal group while still at school. They signed to Coral Records and achieved four Top 5 hits in the early 1950s (Rag Mop, Sentimental Me, Undecided, Can Anyone Explain) before joining RCA where they scored 27 hits in the charts from 1953 and 1960. The 4 listed hits were re-recorded in stereo for RCA and have been included here as bonus tracks. In "Sing The Best In The Country", the brothers selected hits that were country or folk orientated (Jambalaya, Half As Much, Tennessee Waltz) and made them their own. "Words And Music" feature family favourites (Loch Lomond, Sweet And Low, Home On The Range) making this CD a very enjoyable listening experience. The 28 re-mastered tracks are appearing on CD for the first time and in stereo!